Without a doubt, Madrid ranks among the most charming capital cities in the world for business and leisure travellers alike. The city’s lively and cosmopolitan allure shows no signs of waning in the immediate future – quite the opposite, in fact. Visitor numbers to the Spanish capital have fared relatively well in what has been a challenging period for many of its European neighbours. With 743 hotels to its name and no shortage of sun, shops or cultural attractions to sample, Madrid’s status as an emerging business and travel hub sets it apart from the pack. In terms of weather, Madrid is a city of extremes. In the summer it boasts lofty temperatures of up to 30C, and in the winter temperatures drop below freezing, especially at night. Spring and autumn, therefore, are the best times to visit the city if you prefer the days to be warm and the nights cool. The city’s central location means there are plenty of transport options for visitors. Madrid’s commercial airport, Adolfo Suárez-Madrid Barajas airport, is well connected to the downtown area, and access by road or rail is an uncomplicated affair. The capital’s metro and bus systems are also quick and easy to wrap your head around, and, of course, taxis are always an option. While steeped in history and tradition, Madrid is a very modern city, and its cosmopolitan sensibilities have created a cocktail of international flair and traditional charm. The city’s main contemporary art and design centre, Matadero Madrid, was once a slaughterhouse. As such, the venue’s eerie setting and eccentric interior make for quite the experience. 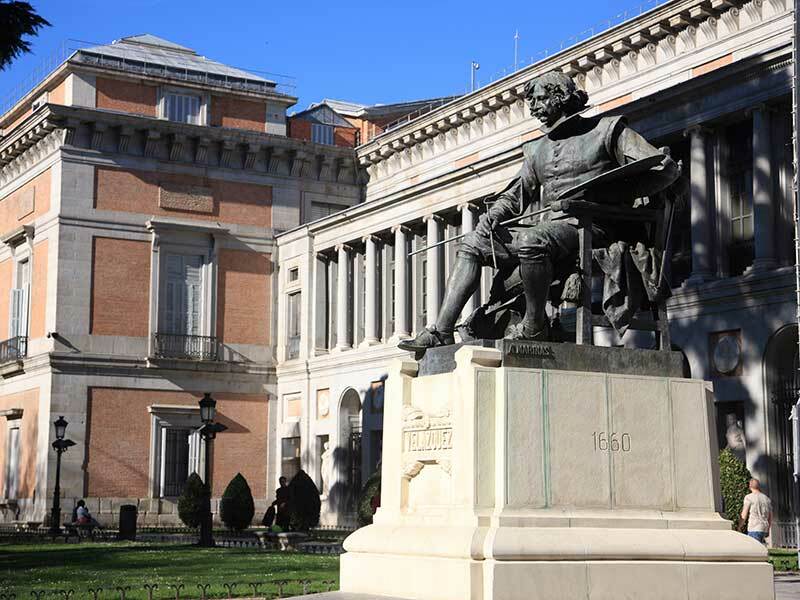 Madrid is also home to Spain’s national art museum, Museo Del Prado, which holds over 10,000 works of art. On the more traditional side, the Royal Palace is the largest palace in Western Europe, and its museum houses furniture, tapestries, paintings and ceramics by some of the country’s best-loved artists. Madrid’s many squares are also home to some of the city’s most notable sites. The Plaza de Cibeles is home to the Bank of Spain, while the Plaza de la Villa is home to the 15th century Torre de Lujanes, 16th century Casa de Cisneros and 17th century Casa de la Villa. Restaurants in Madrid range from the hyper traditional to the downright futuristic, and there are few, if any, tastes that are not catered for. Madrid’s speciality chickpea-based meat stew, cocido madrileño, can be found in all of the capital’s traditional restaurants, while the super-stylish Metro Bistro offers cutting-edge cuisine in an intimate setting, and is fast becoming a favourite among locals and visitors alike. 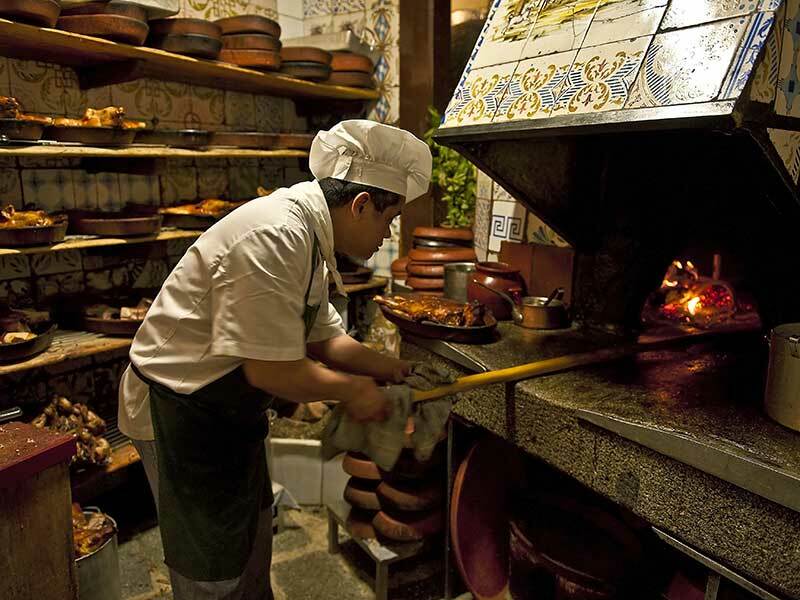 Botin, meanwhile, has a history dating back as far as 1725, and has officially been named the oldest restaurant in the world. Punto MX is another standout choice: its head chef, Roberto Ruiz, is the only chef in Europe to have been awarded a Michelin star for his work in a Mexican restaurant. Madrid is also home to a fantastic array of markets, offering a delightful fusion of traditional and modern dishes made with fresh, local ingredients. Whether meeting for a coffee or sampling the local produce, San Miguel Market, San Antón Market and San Ildefonso Market all offer the perfect setting to indulge in the Madrilenian atmosphere. Madrid is by no means light on luxury, and there’s certainly no shortage of hotels to choose from. The Hotel Ritz offers an unparalleled luxury experience, and its proximity to the city’s museums make it an ideal choice for art lovers. Hotel Orfila is more of a quiet haven, located away from the hustle and bustle. Dating back to 1882, the establishment has retained many of its original features and oozes extravagance at every turn. However, for those seeking a more contemporary feel during their stay, the Petit Palace Art Gallery and Hotel Urban make for interesting alternatives. Madrid also boasts a whole range of new hotels, with the Barceló Torre de Madrid and Only You Hotel Atocha providing an exciting new dimension to the capital’s hospitality scene. The VP Plaza de España and the Four Seasons are also expected to add to this complement in 2018. Approximately 15 percent of all tourists in Madrid are visiting for business, with the Spanish capital welcoming more than one million corporate travellers every year. Excellent infrastructure, modern congress facilities, highly specialised services and a bright economic outlook all complement Madrid’s exhaustive range of accommodation. The city is seventh in the International Congress and Convention Association (ICCA) rankings for association meetings by participant numbers and the sophistication of the conference venues, meaning that it is in an ideal position to move further up the pecking order. 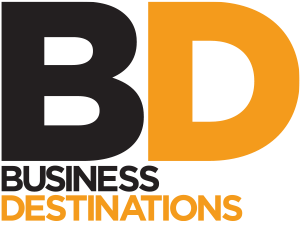 The Madrid Convention Bureau, as negotiator between all companies and organisations linked to the meetings industry, has featured heavily in the city’s emergence as a rising star of the European conventions circuit. As a convenient gateway between Europe and the Americas, Madrid boasts an extensive selection of meeting locations and conference centres, ranging from well-established venues like Palacio Municipal de Congresos, IFEMA and Recinto Ferial Casa de Campo to new, versatile spaces such as the Florida Retiro, Espacio Commodore and Sky Centre. As far as Madrid’s resident businesses are concerned, the city is host to approximately 90 percent of all companies operating in Spain and ranks third in all of Europe for its number of multinational businesses. The World Tourism Organisation, Telefonica and Repsol all call Madrid home, and the diversity of the businesses is itself evidence of the city’s investment credentials.